Tottenham manager Andre Villas-Boas believes Arsenal are in a "negative spiral" of results that will be "extremely difficult" to get out of. Spurs beat Arsenal 2-1 on Sunday to go seven points clear of their rivals. Pressure has mounted on Arsene Wenger recently after FA Cup elimination at home to Blackburn and a 3-1 Champions League defeat by Bayern Munich. "We are on an upward spiral in terms of confidence and they are in a negative spiral in terms of results," he said. "To [get] out of that negative spiral is extremely difficult." Goals from Gareth Bale and Aaron Lennon inflicted Arsenal's first Premier League defeat in six games, and only their second in 2013. But after being dumped out of both domestic cups by lower-league sides, discontent has grown at the Emirates. Although the Gunners, who are without a trophy since 2005, look increasingly likely to miss out on Champions League football for the first time in 16 seasons, Villas-Boas remains cautious. "Seven points is not big enough in the Premier League, because this time last year Arsenal came back [from a similar deficit]," he said. Arsenal's 5-2 victory over Tottenham in February 2012 took Wenger's side to within seven points of Tottenham with 12 games remaining. The Gunners eventually finished a point ahead of Tottenham and their third-place finish, combined with Chelsea's Champions League victory, ultimately denied Tottenham the chance to play in Europe's top club competition. 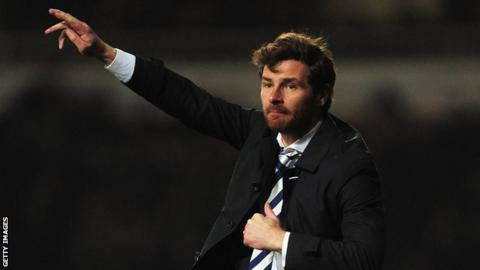 But Villas-Boas was keen to highlight the importance of widening the gap between the two sides. "That was very important," he said of Sunday's victory at White Hart Lane. "It meant a lot for our fans - we wanted to get this one over Arsenal and create a distance between us. "We aim to continue doing well, but we have difficult fixtures coming up against Manchester City and Liverpool. We will try to push on and qualify for the Champions League." The win over Arsenal stretched Tottenham's unbeaten league run to 12 games - their best run since the Premier League began in 1992.